A guide to help professionals/individuals to implement the ICM/WRAP process. 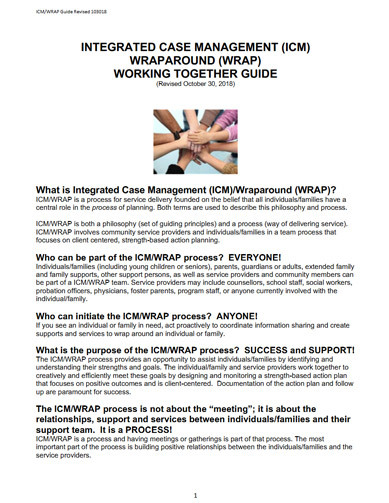 ICM/WRAP is a process for service delivery founded on the belief that all individuals/families have a central role in the process of planning. ICM/WRAP is both a philosophy (set of guiding principles) and a process (way of delivering service). ICM/WRAP involves community service providers and individuals/families in a team process that focuses on client centered, strengths-based action planning.